Need to run Windows 10 on a Mac? 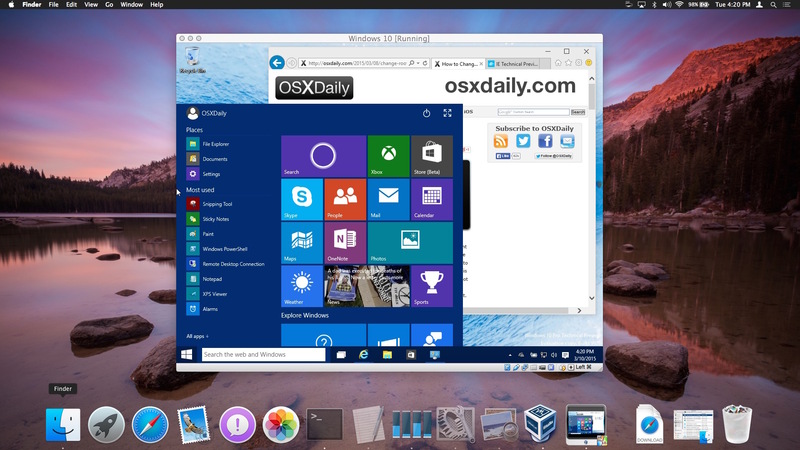 You can install and run Windows 10 in Mac OS X for free using VirtualBox and the Windows 10 Preview from Microsoft. 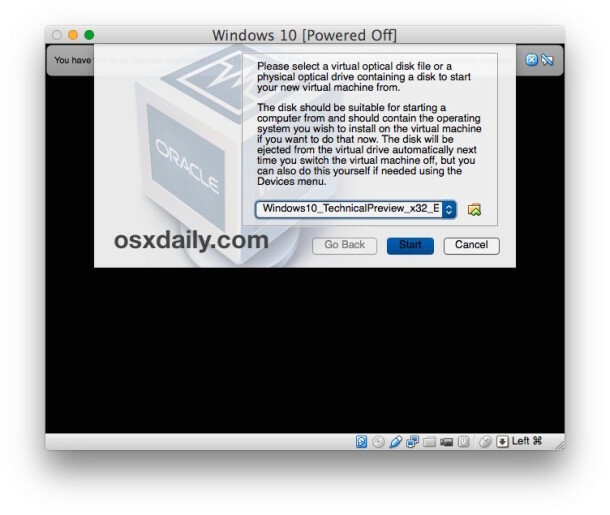 Because this installs Windows into a virtual machine atop existing Mac system software, running Windows is basically like running any other application, which makes it much easier than configuring Boot Camp for a native Windows experience. Setting up Windows 10 to run on the Mac is quite simple and requirements are basic enough, though the more resources the computer has the better the overall experience will be. To get started, you’ll first need to download Windows 10 ISO from Microsoft and get VirtualBox. The rest is just a matter of following the simple instructions, and soon you’ll have Windows running in MacOS X in no time. 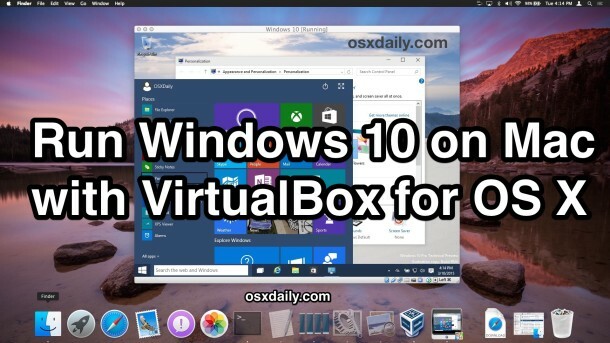 A quick side note: VirtualBox is cross platform compatible, and while we’re demonstrating installing Windows 10 in Mac OS Mojave, MacOS Sierra, Mac OS X High Sierra, El Capitan, Yosemite here, you can actually run through this exact tutorial on any other major operating system as well outside of the Mac. Essentially this means you can run Windows 10 in Mac OS X (High Sierra, Yosemite, Mavericks, you name it), Windows 7, or even Linux, using the exact same software and instructions, nifty huh? When you’re finished, quit VirtualBox like any other application and Windows 10 will shut down. When you want to run Windows again in Mac OS X, just launch VirtualBox again, select your Windows 10 virtual machine, and click the “Start” button to boot Windows in the app. Easy, right? Yes, this is a complete version of Windows 10. These preview builds expire eventually when the final version comes out from Microsoft, but there is some speculation that they may make Windows 10 free. Regardless, when the final version comes out you’ll be able to install it and run within VirtualBox the same way as outlined above. Keep in mind this is a virtual machine, which basically means the VirtualBox app is functioning as a virtual computer on top of your existing Mac. This undoubtedly impacts performance, which is part of why the more resources the computer has the better the experience, so you’re not going to want to be using this for trying to play some wild Windows games in Mac OS X. Nonetheless, this is more than sufficient for basic Windows tasks, using Windows apps like Internet Explorer, or just to get a feel for Windows 10. For a true native Windows experience on a Mac, you’d want to install the OS with Boot Camp as a side-by-side bootable operating system, we’ll cover that another time though. 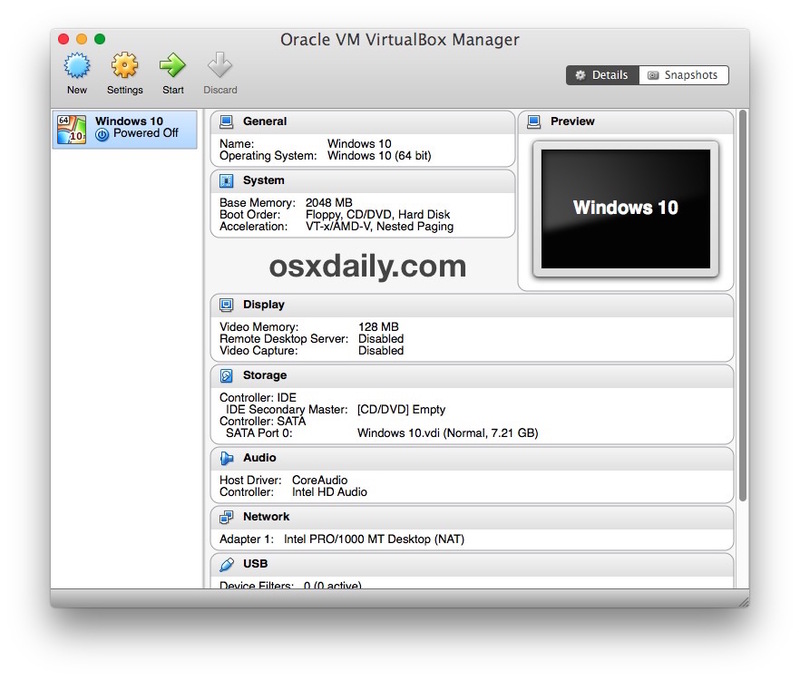 If you’re enjoying this VirtualBox experience, you may be pleased to discover that you can run many other operating systems in the virtual machine environment as well. If you want to try Linux, you can run Ubuntu on your Mac with VirtualBox, or many versions of Internet Explorer in different Windows VMs, Windows 8, even Android 4, older versions of Mac OS X like Snow Leopard, and much more, you can explore our VirtualBox section for more. If you get tired of Windows 10, you can either delete the virtual machine from within VirtualBox, or remove the Windows .vdi file (the virtual disk image) from your hard disk manually. Keep in mind that if you delete the VM, any files that you created in Windows will be removed as well. 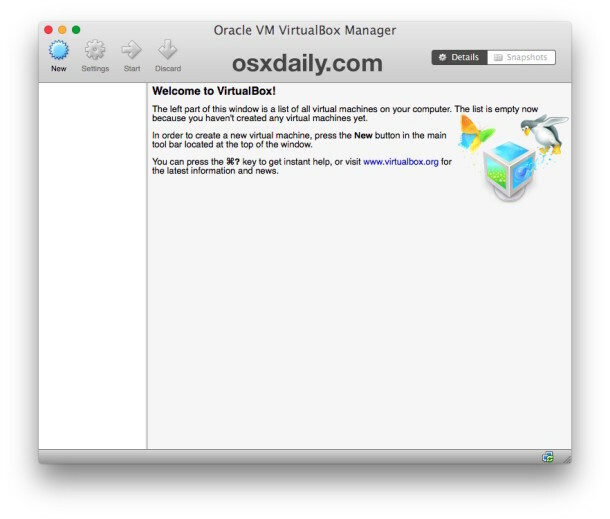 Great tutorial, Virtualbox is really easy which is nice. For those seriously interested in virtual machines, Parallels performance is significantly better, as is VMWare. But, both of those are paid applications, making them better for enterprise or work environments. But VirtualBox is free, so it’s a good place to get started and try things out, to see if having a VM makes sense for your environment. As for Windows in Boot Camp, well, Apple recently abandoned support for Windows 7 in Boot Camp on 2015+ Macs, this is unfortunate because Windows 7 is the most usable version of modern Windows out there until Windows 10 becomes finalized. Not sure what they expect those people to do for the time being, but Windows 10 final will be out soon enough I suppose. You mention you didn’t know what those people are going to do for the time being until windows 10 is finalised. Ah to have Classic AMIGA//no problems the best. Most powerful of all.True Real-Time Multitasking True 64bit, and above all around. Nice programs ,and true UNIX. If you test MS Windows 10, you will never want to come back in Yosemite ! If you hate Yosemite as a ton of ml ppl hate this OS, switch on W10. A mac User since 25 years ! For Windows, Windows 10 is quite good indeed, at least as good as Windows 7. Microsoft is quietly fixing Windows, Apple is loudly breaking OS X. hmm. Agreed your comment’s as well ! I am ok for staying with Mavericks, is what i already do ! But like you say, if you haven’t the last MAC’S machine that not worth the “travel” ! 1/ if i want my sytem up to date, i have to buy “BY FORCE” a new Apple Computer, …i have already 5 Mac’s, Mbp, MbA, Imac, MacPro = but those one’s are not from 2015, why i have to suffer to the Apple pressure, just for upgrade my OS ? 2/ In the case i do not or i can not upgrade my Machine i will stay with Mavericks, right ?, then once Apple take out the Mavericks suport, what i do ? I suffer, the same ex; with my MacPro who stay in LION, because i trust on the Apple Store Agent when i buy my MacPro & make a Configuration to order by adding a Nvidia FX 4500, & this car who cost me a ton, can not be upgradable & the Machine it’Self is also not upgradable to a new OS….& this MacPro run better & faster then all the new IMac & MBP i buy ( Full of Ram & SSD on the MacPro = A Top productive machine ). In each side you think or go, Apple Locked your own volonty to stay with machines who satisfies you ! what elso to switch ? I had Yose running on a Mac pro 1,1 and although I think the interface is horrid it ran perfectly. I’m going to disagree. I am in the beta program and I’ve got Yosemite running on a 2009 Mac Pro, 2010 Mac Pro with Apple 30″ display and 24″ 1080P display, and a 2011 MacBook Pro 17″. Yosemite performance is fast and the OS is not “hard on the eyes” at all — and I have almost 54 year old eyes and I wear glasses. MacWorld is the FoxNews of Apple news, biased as it gets and trumpets the party line, never deviating. Have you ever seen an Apple product get a review of less than 4 or 4.5 out of 5 mouses on MacWorld? Nope, never happens. So of course MacWorld is going to say “OS X Yosemite is great!”, remember there used to be a MacWorld Conference that Apple would present at! Talk about conflict of interest! Don’t worry, FoxNews is going to like Jeb Bush too, vote for Jeb says FoxNews, he’s great! Jebby gets 5/5 stars! The fact is some hardware can’t run OS X Yosemite well, some can, some can’t. That’s an optimization issue, the software needs improvement. On my 2013 MBA (8 GB) and my 2008 (!) iMac (4 GB! ), Yosemite runs wonderfully. Best OS X version yet. I have none of the features you’ve mentioned and Yosemite runs fine on my Mac. I have a low-spec’d 2011 iMac, and it’s perfectly fine. Not fine enough for everything (e.g. if I even tried the above guide, it’d probably die), but that’s just a sign of the times. That’s not Yosemite’s fault; that’s aging technology. A correction, these are NOT complete builds. Usable, but still not the final, complete version of the software. And these builds will eventually expire when the final Windows 10 is released. Another note, the speculation about Windows 10 refers to the upgrade from an existing Windows install (Windows 7/8/8.1). No word as if a full clean non upgrade license will be free. Yes correct, this is the preview version of Windows 10. One to be aware of on the cross platform note is that you run VirtualBox on a PC VT-x must be enabled in BIOS. I have Windows XP as the guest(per VirtualBox) on my Mac OS 10.9.5. Can I replace XP with Windows 10 following the format described above? Just create a new VM for Windows 10, no need to replace Windows XP. Keep those two VM’s separate. Besides, your XP is probably final, whereas Windows 10 is still Preview. Thanks bon – I’ll do what you have suggested! bon gives good advice, you should definitely just keep the virtual machines separate to preserve both environments. I have Yosemite running on a 1987 Packard-Bell with a monochrome CRT and a dot-matrix printer. I have Yosemite running on a TI classroom set solar calculator from 1983 and it runs incredibly. Has anyone actually tried and gotten the Windows 10 downloads to actually install and work as noted above in the instructions? I’ve download both of the following versions and neither will work in VirtualBox. I’ve downloaded and saved both to my desktop and chosen the options cited above, but no luck. Both the US English Windows 10 Technical Preview (x64) – Build 10041 and Windows 10 Technical Preview (x86) – Build 10041 versions fail to install as a new Virtual Box instance. The medium ‘/Users/Craig/Desktop/Windows10_TechnicalPreview_x64_EN-US_10041.iso’ can’t be used as the requested device type. Failed to open the hard disk file /Users/Craig/Desktop/Windows10_TechnicalPreview_x64_EN-US_10041.iso. Glad you got your Windows 10 VM working, what did you have to change to resolve the errors you were getting? OR.you could download the pre built virtual machines that Microsoft provide. Surprisingly easy to install, and seems to work fine on my 2011 MacbookAir, no heating issues which can be a problem when I use Windows 7 in Parallels or BootCamp. The only problem I found was that the Mac keyboard isn’t the same as a Windows one, and finding the @ symbol to sign in took some time, solved by using the virtual keyboard in Windows. Hasn’t worked for me. After the initial set up, it reboots but just sits in the blue screen with the white dots going in a circle. It can take a while to boot Windows 10 depending on the speed of the Mac, what you’re seeing is the Windows 10 bootup sequence though. I have finished the installation and windows starts up. I am not able to get it networked/online. Any instructions / help on this? It’s covered in the help pdf file. Any tips how the install Windows 10? It’s a virtual machine so it will take many hours perhaps depending on the speed of your computer. Faster Mac will install faster. I have a mac book pro retina, 2.7 GHz i7, 16 GB. I left the process run during the night, but am still waiting. Is there still a chance the install would get ready? It worked! Install took about two nights. thanks for your help! it takes a while to complete, the virtual machine is slower than native hardware. Eventually, Windows 10 will boot. There is no option for Windows 10 on my virtual box. I think theres something wrong with my virtual box, because none of my virtual machines work. As soon as i press start, virtual box crashes and my mac shuts down. Anyone know what the problem might be? Great tutorial, thanks. I would like the virtual box/Windows to be larger, fill the screen, but it is stuck at that size as in your screenshots. How can I get it to match my screen size 1920×1080. When I select “Switch to Scaled Mode” it does resize, however it does not retain proper ratio and the screen image is stretched. Jake, did you figure this out? Please share the answer if you did! I installed Win 10 in the virtual box as instructed and it runs really slow. 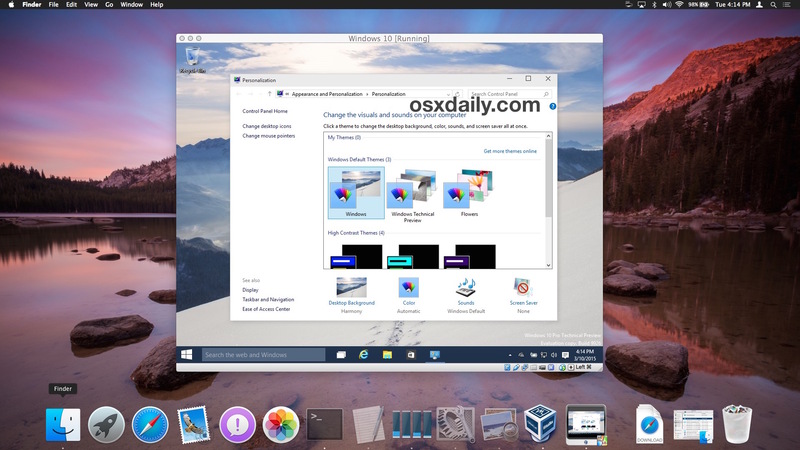 I have a Win XP running in Parallels 8 and it is seamless with the Mac and fast, Can Win 10 be installed in a Parallel 8 virtual machine?? I called parallels. I have version 9 and they said its NOT compatible with windows 10. I installed it successfully, but the icons are very large and out of proportion. I’ve downloaded the x86 version directly from Microsoft and configured the windows 32 on the VM. I think till there is ok. The I’ve got the initial screen to chose my language. Now it ask for a product key to activate windows. What I do? skip? But if we skip we get the preview version only. Is it ok? Oh, just found it at Microsoft website… sorry! I’m having the same problem with not having a product key. Where you able to figure out a solution to this? Hi. Where to get some activation key for the windows? The Windows 10 activation key is available when you download the ISO from Microsoft, it’s on the page. There is no activation code available? Could you be more specific please? I need Open GL 3.0 or higher for the app I want to run on Windows, but with Windows 10 on Vitual Machine I only have Open GL 1.1. I cannot get Virtualbox to open in El Capitan. Is there a compatibility problem? When it asks ‘Please select a virtual optical disk file’ and I click on the file to select the downloaded file but if gives this message. Failed to open the disk image file /Users/Anna/Desktop/Win10_1511_EnglishInternational_x64.iso. Could not get the storage format of the medium ‘/Users/Anna/Desktop/Win10_1511_EnglishInternational_x64.iso’ (VERR_NOT_SUPPORTED). What am I doing wrong or is something missing? The error says “Version not supported” which suggests you need either a newer version of VirtualBox or a different version of the Windows 10 ISO file. When it asks ‘Please select a virtual optical disk file’ it says empty in my file place and when I look for other folders (or other stuff like that) I can’t find anything that could be used as a virtual optical disk file. You Did not tell the Editing steps. How can we edit? 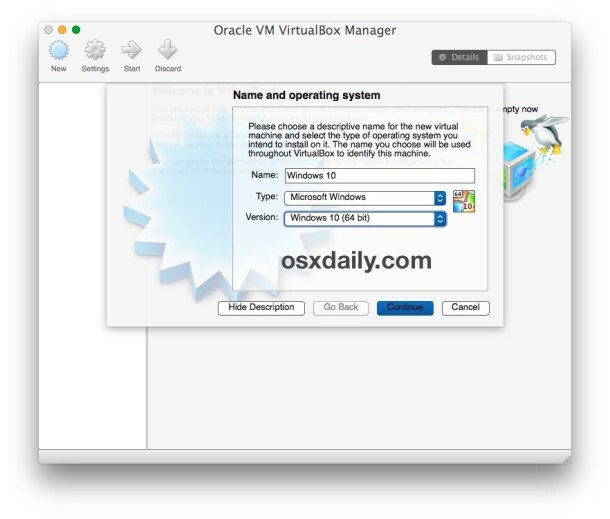 If you want to directly create a virtual machine and click on start it won’t work. It needs some configurations. Am I right? Hello! This information was extremely helpful, I want to do this but instead put a Mac on a Windows 10 CP. If you could forward me the info if you already have it or something to that extent I would appreciate it. When it asks which type of installation do you want? which do i choose? Upgrade or Custom? Im up to the part where it asks me to “Create an account for this PC” and I am unable to to type or move the mouse curser within the program. I am using a Macbook pro 10.11.3 if that information is useful at all. A solution to this problem would be much appreciated! Thank you for your time. I dont understand. I cannot find the activation key. Can someone help? I’ve successfully installed Windows 10 Pro on my MacBook Pro running Sierra and using the latest VirtualBox. However I cannot get my external USB connected Apple Super Drive to be recognised or show CD’s on Windows 10. Is there any way to fix this as its the only reason I’ve had to install this set up – to open and view Windows formatted CDs. Really appreciate the help. I’d appreciate some help on this. This is the only blog I’ve found with a quick click to the ISO information, everyone else brushes over it or doesn’t explain it what-so-ever. Kudos! Thank you for filling the void! Installation of VirtualBox failed. Any suggestions. My machine is an iMac Retina 5K 27 inch late 2014 with 4 GHz Intel Core i7 32 GB memory and a 3 TB Fusion Drive.